Incorporate a 1"" luxurious memory foam layer, bonded to a 2"" CMHR 40 density foam base. 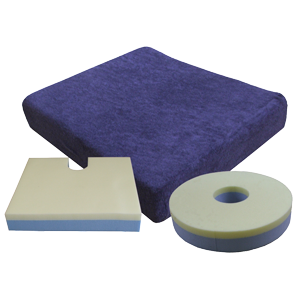 Incorporate a 1" luxurious memory foam layer, bonded to a 2" CMHR 40 density foam base. Type | Size R (Ring Cushion) - 17" diameter C (Coccyx Cut Out Cushion) - 18" x 16" x 3" T (\'T\' Cut Out Cushion) - 18" x 16" x 3" P (Cushion Without Cut Out) - 18" x 16" x 3".